2. Calculation: How much does an EWC meeting cost? With the exerted pressure of the French Minister of Labour Xavier Bertrand the leading associations of trade unions and employers took a decision of general principle at a European level which will influence the further course of the revision procedure of the EWC Directive substantially. At a conference of the Labour and Social Affairs Ministers of the EU on July 10th and 11th, 2008 in the Castle of Chantilly north of Paris (photo), the headquarters of the French army in the first World War, they accepted the bill of the European Commission as a base. During the summer break there were intensive discussions between the social partners to overcome the remaining differences. On August 29th, 2008, they presented to the public a common recommendation with eight concrete wording suggestions which shall be changed in the bill. However this change little in the core of the basic philosophy of the outline. More important is the fact that with this joint recommendation all sides have politically accepted a revision of the EWC Directive in the suggested scale. Objections as they were formulated by the employers' federations or further-reaching demands of the trade unions (see report in EWC News 2/2008) will hardly play any role. Since it isn't a full revision of the EWC Directive but merely a "recast" (a restatement of the existing Directive) as originally planned, the influence possibilities of the European Parliament are strongly restricted. On October 2nd, 2008 the bill was again on the agenda of the meeting of EU Ministers of Labour in Luxembourg. They declared in view of the joint recommendation of the social partners for the fast adoption of the changed Directive. A meeting takes place in Lyon for the transnational social dialog on November 13th and 14th, 2008 where the topic is discussed publicly once again. While the conservative French government is actively promoting a fast revision of the EWC Directive, an internal paper of the social-democratic British government caused unrest among trade unions. Fundamental British doubts ("UK Concerns") are listed there: the competitiveness of EU companies is in danger if European works councils could hinder the implementation of restructurings. A rigorous impact assessment of the amendment of the law is demanded. The British government warns of a setback for the European works councils if the legislator limits the flexibility of the business parties too much. This could deter many companies from the formation of an EWC, which don't have any EWC till now yet. An over-regulation would actually weaken the employee voice on a transnational level. Labour Party representatives in the European Parliament however do not share this liberal opinion, they stand behind the demands of the trade unions. The British lobby work behind the scenes, however, couldn't prevent the joint recommendation of the social partners from August 29th, 2008. Therefore the British Department for Business, Enterprise and Regulatory Reform (BERR) reacted promptly and published a consultation paper on September 11th, 2008. Until October 6th, 2008, British companies can transmit their opinion, which then is given effect by the British government in the European Council of Ministers. To be prepared for such objections, the European Commission worked out an impact assessment of its own for the revision of the EWC Directive. The document was published in July 2008. The European trade union institute in Brussels published a scientific memorandum for the revision of the EWC Directive on August 26th, 2008. Based on current experiences concrete recommendations are formulated to the politics. Symposium to the new EWC Directive: What comes towards us there? Many EWC members are still uncertain about the legal consequences of the revision of the Directive and would like to design their current EWC agreement on the basis of the new legal situation. Works council members who still have the EWC foundation ahead also would like to early include the new regulations in their considerations. A number of questions will also arise for lawyers after the adoption of the new EWC Directive at the end of the year 2008. The training and consultancy network " euro-workscouncil.net " offers the opportunity on January 26th, 2009 on a symposium in Hamburg to discuss the new legal situation in detail with experts from Brussels as well as from Germany with theoretical and practical background. The symposium is carried out in German. Interested parties in other languages are invited to contact us directly for the purpose of individual arrangements. On behalf of the European Commission the consultancy firm GHK Consulting from London conducted between January and April 2008 telephone interviews in 70 companies, which have a European works council. Amongst them were 14 French companies as well as ten each with headquarters in Germany and the UK. Meanwhile the final report, which exactly estimates all costs a European works council causes is available. So a plenary session of an EWC costs on average € 101,000 and reaches in the individual case € 370,000. Half of it is being allotted to travelling expenses (15%), interpreters (22%), hotel and catering (15%). The continued payment of wages of the workers' representatives is calculated with 29%. The costs of the steering committee come to on an average € 25,700, what contains three annual meetings. A further education for the complete EWC costs € 43,800. Even higher costs cause the SE works councils, so the name of the European works council in the European Company (SE). The "most expensive" EWC meetings carry out French companies, followed by German companies, while the EWC costs are less than half as high in British and non-European companies. It can hardly astonish that the quality of EWC participation rights is also developed differently. The participation of employer representatives in EWC meetings makes an impact with 14% in the calculation. This isn't travelling expenses but merely around the working time. As a rule, the CEO reports together with further managers of the topmost executive level in an EWC plenum meeting. It is reported in the study that in some enterprises up to 13 managers report in the EWC meeting. On today’s usual top salaries a four-hour Powerpoint presentation of the management can therefore drive the budgeted costs of an EWC quickly into dazzling height. This may also be one of the reasons why the legally specified minimum number of EWC meetings shall not be increased in the opinion of the employers' federations. To be able to meet the policy units of multinational companies on a par, workers' representatives need good advisers. The costs for it amount in non-French companies on € 3,500, in French companies however on € 143,700 and in the individual case up to € 500,000 every year. These numbers show why French councils significantly exhaust their information and consultation rights (if necessary also by legal proceedings) better than councils of other countries. Even well equipped German councils have a considerable catch-up demand in this (see report in EWC News 1/2008). The cost differences are easily explained: as a rule, a European works council outside France is advised by a full-time trade union officer who doesn't bill for his activity. On the other hand, there is only little full-time trade union machinery in France which hardly is able to guarantee the continuous advice of a variety of EWC bodies. This gap is closed by private consultancy companies like the Groupe Alpha or Syndex. An additional difference: the EWC in many big German companies has employed subject specialists on a regular basis at its disposal who aren't credited as adviser costs although they do the same work. The British Department for Business BERR adds the annual costs for a European works council up on about £ 137,000 (€ 176,000). By the planned change of the EWC Directive they will increase to £ 215,000 (€ 277,000). The meeting of a special negotiation body (SNB) of the duration of a day is valued with about £ 62,000 (€ 80,000). The current bank crisis will destroy up to 200,000 jobs of the financial community in North America and Europe in the opinion of the finance section of the confederation of service sector trade unions (UNI). To analyse the consequences for every single company, UNI Finance has demanded special meetings in a circular to members of 51 European works councils on September 30th, 2008. They shall take place within a few days. In the opinion of UNI Finance the finance market crisis is a situation of extraordinary circumstances, which seriously concern the interests of the employees. The current EWC Directive provides the right to special meetings for it. UNI Finance publishes up-to-date reports on the crisis from a trade union viewpoint on a special web page. UNI Finance put forward a list of requirements for the better supervision of finance institutes and rating agencies already in September 2007 and pointed to the ethical and social dimension of the financial crisis. After the crisis had intensified, UNI Finance demanded a better regulation of the finance markets in May 2008 once more. The European Trade Union Confederation (ETUC) voiced in favour of fairness and determined behaviour at a meeting in London on September 27th, 2008. In connection with this, there are great differences on how social responsibility is practised in individual banks and insurances. According to an UNI study from the year 2007 the enterprises Barclays, Dexia, KBC and Nordea are good examples whereas companies like Generali, Royal Bank of Scotland, UBS or West LB are regarded as specially bad examples. Many banks and insurances, among this Deutsche Bank, Axa or UniCredit, are in the midfield. On September 29th, 2008 the British building society Bradford & Bingley was nationalized and the savings business with all the 200 branch offices was taken over by the Spanish bank Santander. 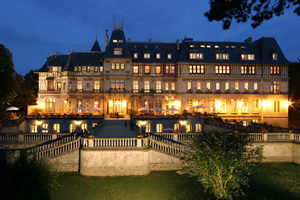 This had already taken over the British bank Abbey National in 2004 and thus became the largest bank of the euro zone. There wasn't an EWC with Bradford & Bingley yet, the staff is in future represented by the European works council of the Santander group, which was founded in 2005. On September 18th, 2008 the British bank Lloyds TSB announced the take-over of the largest British building society HBOS which had come into being in 2001 from the merger of Halifax and Bank of Scotland. The new group will have a market dominating position. As a result of the merger from the about 130,000 employees up to 40,000 will lose their job. Since 1999, Lloyds TSB has a European works council which meets in London once a year. Its members come from Britain, Germany, Spain, France, the Benelux countries and Switzerland. The tax havens Gibraltar and Monaco also send a workers' representative respectively. HBOS didn't have an EWC till now yet. A redundancy scheme was signed in the Swiss big bank UBS on July 28th, 2008. 5,500 workplaces shall be cut as a result of the finance market crisis, half of this in Switzerland. But the downsizing doesn't come to an end yet, central management announced the reduction of further 2,000 jobs on October 3rd, 2008, this time particularly in the UK. Till now, there isn't a European works council at UBS yet although the company is represented in 21 European countries and is part of the leading finance institutes worldwide. It became known on July 12th, 2008 that the U.S. Citigroup sells its German branch offices as result of the finance market crisis to the French co-operative bank Crédit Mutuelle. This is steered from Strasbourg, has their main emphasis in the Alsace, in Lorraine and in the Burgundy and is regarded as a preferential partner for the administration of social funds by French works councils. The 6,800 German Citibank employees aren't represented by the European works council of Citibank in future any more. Till now, there isn't a transnational employee representation at Crédit Mutuelle yet although the bank is already represented in Belgium, Luxembourg, the UK and Switzerland. The European Metalworkers’ Federation (EMF) together with the European works council founded a trade union coordination committee for Siemens at a meeting in Brussels on July 17th, 2008 to plan Europe-wide actions against the announced downsizing. Such committees have already proven of value in other companies in addition to the work of the EWC particularly at heavy restructurings (see report in EWC News 2/2005). On July 22nd, 2008 the EMF addressed EU Commissioner Vladimír Špidla in an open letter complaining the violation of the EWC Directive by Siemens management. On 19th August 2008, the new Siemens committee experienced its first test during its second meeting in Prague where the work for rail vehicles shall be closed or sold. With the presence of 25 representatives from eleven countries and a strike on 20th August 2008 it was possible for the Czech works council to obtain an agreement on guidelines with the plant management on 25th August 2008. IG Metall was also represented with a delegation so that the same standards apply to redundancy scheme negotiations abroad as of Siemens in Germany. Siemens announced in the press on September 19th, 2008 to close the plant in Thessaloniki (Greece) with 240 employees to October 31st, 2008. Neither the local nor the European works council had been informed before, what is a clear violation of the EWC Directive -- comparable to the case Nokia Bochum. However this agreement binds only the new owner and not the management who meanwhile announced restructurings. So Continental has got a new structure since September 30th, 2008 with only two divisions: the automotive and the rubber division. It is speculated in the press that the rubber division could be sold and automotive merge with the corresponding division of Schaeffler. With that the agreement of August 22nd, 2008 would be practically invalid. After the take-over of the majority of shares the future of the Continental European works council also is in question. The minimum requirements of the EWC Directive provide only for a single council for the entire group, in this case Schaeffler, after such fusions and don't recognize any division representation. While Continental has an European forum already since 1992 and was one of the first German companies, after Volkswagen, with a transnational employee representation at that time, an EWC agreement was signed at Schaeffler only in October 2007 (see report in EWC News 1/2008). On September 25th, 2008 the European works councils of Hewlett-Packard (HP) and Electronic Data Systems (EDS) met in London for a joint special meeting to get informed about the planned reduction in staff as a result of the merger. In opinion of the workers' representatives there isn't any financial necessity for the cut of 7.5% of all jobs. They demand an honest consultation procedure from central management, which shall lead into negotiations about an Europe-wide redundancy scheme. HP becomes the worldwide second largest IT-Service provider by the take-over of EDS behind IBM. In 2005 a considerable downsizing had already taken place at HP (see report in EWC News 3/2005). Both U.S. companies have an EWC according to Belgian law since 1996. The two councils will soon be amalgamated. On May 13th and 14th, 2008 the European works council for GeoPost, the package division of the French La Poste, constituted itself in Paris. Most important foreign daughter is the German parcel service (DPD). The EWC consists of three members each from France and Germany, two from the UK and one each from Ireland, Belgium, Netherlands, Spain, Portugal, Greece, Czechia, Poland and Lithuania. Switzerland has an observer status. Since it is a French agreement, the chairmanship lies with the employer. The steering committee consists of five members: the secretary comes from France, its deputy from Germany, further members are from Spain, Belgium and Czechia. Plenum meetings take place twice per year. Typical for French agreements is the exact frame for the time-off: The secretary of the EWC gets 120 hours per annum, the members of the steering committee 60 hours and all other EWC members 20 hours in addition to the participation in meetings. Per annum a training day is scheduled. The preparations for the EWC foundation were supported by the training and consultancy network " euro-workscouncil.net " (see report in EWC News 4/2006). An EWC agreement was signed for the 42,000 European employees of Safran in Paris on July 4th, 2008. The French group resulting from a merger in 2005 produces mainly aeroplane and armour electronics. An European works council which had been formed at Snecma, one of the two predecessor companies, in 2001 is dissolved now. The new EWC will consist of 25 members, amongst them nine from France, two each from Belgium, Germany and the UK and one each for the other ten countries. They meet under the chairmanship of the employer once a year. Special meetings take place if as a result of a measure at least 1,000 employees are concerned in more than one country. In all other cases the steering committee is responsible, this consist of five members, three come from outside of France. The steering committee has a budget of € 25,000 for interpreters and experts and of € 8,000 for travelling expenses at its disposal in addition to the costs of the plenum meetings. The secretary of the EWC gets eleven days time-off, the members of the steering committee six days and all other EWC members one day per annum in addition to the participation in the meetings. Every EWC member can take ten days study leave for language courses. An EWC agreement was signed for the company AgustaWestland according to Italian law in Farnborough (UK) on July 17th, 2008. The European forum consists of eight workers' representatives each from Italy and the UK. A six-headed select committee leads the business between the annual plenum meeting. AgustaWestland is a daughter of the Italian armour group Finmeccanica which still hasn't established any EWC. An EWC agreement was signed for Wabco in Brussels on October 1st, 2008. The U.S. company produces braking systems and was until 2007 a subsidiary of American Standard, where an European works council existed since 2001. After the start on the stock exchange Wabco gets an EWC of its own now. Although the agreement is subject to Belgian law (works councils are equal committees in Belgium), the Wabco EWC only consists of workers' representatives. It meets once a year and chooses a steering committee of five, which meet with central management three times a year. Special meetings take place if by a change of business 50 jobs are concerned in at least two countries. The main features of the agreement are strongly orientated at the old rules of American Standard (see report in EWC News 1/2007). The texts of numerous EWC agreements are available on a download side. Since June 4th, 2008, Rio Tinto has an European works council according to French law which also contains Switzerland besides the European single market. The raw material group took the Canadian aluminium group of Alcan in July 2007 whose most important European production centres lie in France and Switzerland (see report in EWC News 2/2007). Many regulations of the EWC agreement of Alcan which had been negotiated after numerous fusions in March 2006 (see report in EWC News 2/2006) are valid for the entire group Rio Tinto now. On June 19th, 2008 an agreement was reached for the French car manufacturer PSA Peugeot-Citroën, which extends the equal finance committee of the group which was accessible to only the French workers' representatives till now to Germany, the UK and Spain. Business alterations and consequences for the personnel policy shall be discussed there early ("Anticipation of change"). The finance committee is an addition to the activity of the European works council and its select committee. It met for the first time in the extended composition on July 1st, 2008 and among other things dealt with the product plannings of the group and the development of the business in Germany. PSA Peugeot-Citroën had strongly been under union criticism in summer 2006 when the closure of a British factory with 2,300 employees was announced without consultation of the European works council (see report in EWC News 2/2006). The equal finance committee shall help to prevent such unilateral management decisions. We usually report about the foundation of European works councils in EWC News, sometimes there are however also opposite developments. An EWC which had been formed according to Dutch law in the machine assembly company Milacron in 2000 was abolished again now. The U.S. company sunk below the threshold of 1,000 employees in Europe and therefore doesn't fall into the scope of the EWC Directive any more. On February 13th, 2008 central management and European works council reached an agreement to rest the EWC agreement as long as the staff has reached the legal threshold again. On May 22nd and 23rd, 2008, 90 workers' representatives of the drink group met for their second conference in the NGG education centre in Oberjosbach nearby Frankfurt am Main (Germany). They founded an alliance for the worldwide 600,000 Coca-Cola employees, a kind of precursor to a world works council. The alliance is led by a steering committee to which representatives from all continents belong and which meets twice every year with central management in the USA. A representative of the central management from Atlanta took also part at the conference in Oberjosbach and faced the questions of the delegates from 32 countries. Trade unions and central management had come to an agreement to carry out regular meetings in 2005. Workers' representatives of the British retail chain Tesco from twelve countries met in Nyon (Switzerland) on June 18th, 2008 to form a network. The aim is not only the formation of a global dialog forum with central management but also the formation of a European works council, which would embrace the UK, Ireland, Czechia, Slovakia, Hungary and Poland. Tesco is market leader in the United Kingdom and number three in Europe. A framework agreement which guarantees worldwide social standards in all branch offices was signed for Danske Bank in Copenhagen on September 9th, 2008. The Danish bank had replaced the EWC agreement in December 2007 and goes far beyond the minimum requirements of the EU Directive. At present, an EU project on strengthening of the cooperation in the EWC is carried out (see report in EWC News 1/2008). Similar to the Directive on European works councils the Directive on workers participation in the European Company (SE), which was adopted in 2001 also arranges in article 15 for an obligatory audit namely 8th of October 2008. On 30th of September 2008 the European Commission in Brussels informed that this is postponed to 2009 and will be dealt with after the new election of the European parliament and the Commission. If a German company grows beyond the threshold of 2,000 employees, then the supervisory board is appointed by workers' representatives to 50%. Whereas when a German SE grows beyond this threshold it stays with a third participation of the employees in the supervisory board. The SE Directive safeguards the size of the participation only on the scale as it is at the time of the SE foundation. A customization is missing for the time after that. More and more companies meanwhile use this "loophole" to avoid growing employee participation and transform themselves into a SE. This possibility is pointed to specifically in the German economy press (see report in EWC News 2/2008). An expert group engaged by the European Commission has recognized this problem by now and suggests a customization of the SE Directive. Similar problems also can appear at the foundation of a SE which doesn't employ any worker and buys up companies with bigger staff later. There is even a considerable number of stockpile foundations meanwhile, that is a company shell without business activity. The example Volkswagen shows how difficult a legal contestation of a SE agreement is (see report in EWC News 2/2007). The pump manufacturer Wilo from Dortmund (Germany) has enrolled as an European Company (SE) since July 24th, 2008. A participation agreement which confirms a one-third participation of the employees in the supervisory board had been signed on July 1st, 2008 a few days before. Wilo has worldwide 6,000 employees, in Germany almost 1.900. The company can avoid an equally occupied German supervisory board, which is legally binding as of 2,000 employees, by transforming into a SE. According to existing SE law the status quo (here the German one-third participation) is confirmed for ever. With the SE transformation the European works council existing since 1996 is also transformed into a SE works council. This meets once a year and covers the European single market (all EU countries as well as Norway, Iceland and Liechtenstein, not however Switzerland). It chooses a select committee of five. Wilo has production centres in Germany, France and Ireland. The countries with small staff are combined to groups, these vote for regional representatives. The SE works council has an access right to all sites in Europe. A SE agreement was signed for the textile company Gütermann with seat in Gutach (Germany) on May 16th, 2008. The company has locations in Europe in Germany, Spain and Switzerland. The transformation into a SE was carried out on June 14th, 2008. There wasn't any European works council with Gütermann till now, the SE works council will be the first transnational employee representation. 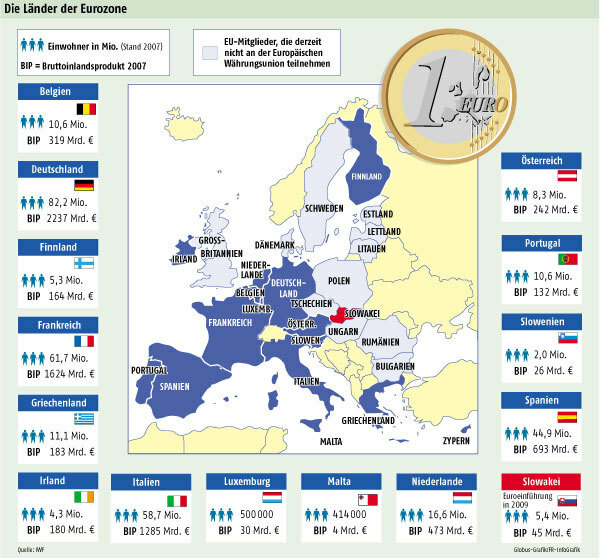 The currency area of the Euro will include additional five million people on January 1st, 2009: The European single currency replaces the Crown in Slovakia. The country has mastered the criteria for the joining with bravado. Slovakia recorded an economic growth of over ten per cent in 2007 which corresponds to almost Chinese conditions. As the first country in Eastern Europe Slovenia joined the euro zone already on January 1st, 2007 (see report in the EWC News 3/2006). On September 26th, 2008 the EU agreed to Switzerland joining the Schengen agreement. Most likely in December 2008 all identity checks with the EU at the borders of Switzerland will be abolished. The country gets the same status as Norway and Iceland. However, the accession to the Schengen agreement is the reason, that the border between Switzerland and Liechtenstein is controlled for the first time since 1923 (24 hour video supervision). The principality is the only remaining not Schengen country in whole Central Europe. Already on December 21st, 2007 the circle of the states which do without controls at their common borders had increased from 9 to 24. Since then all middle and Eastern European EU countries with the exception of Romania, Bulgaria and South-Cyprus belong to the Schengen zone. By travelling in Europe one must only show his passport when going to the United Kingdom, to Ireland, onto the Balkans or further east. Between Athens and Reykjavik, between Lisbon and Riga there is a boundless freedom of movement. The joining of Liechtenstein and South-Cyprus will be carried out in 2009 or 2010. Explanation: What is the Schengen agreement? With a lively sound visitors are welcomed on the new internet page of the European works council of the French insurance group of Axa. After the take-over of the Swiss insurance Winterthur in December 2006 (see report in EWC News 1/2007) it has increased to 61 members and thus belongs to the larger EWC bodies. The web page is available in several languages. The web page " who-buys-whom " is a current German-language news service for company take-overs. All relevant reports are provided on the initial page and are callable also to lines of business. Moreover, the profile can be investigated by investors (e.g. Private Equity companies). The EU financed trade union project " BalticTU.NET " devotes itself to the development of the employee participation in the branch offices of Scandinavian companies in the three Baltic states. The main emphases are on the retail trade, in the hotel industry, telecommunications, and in the finance sector. The European works council is also one of the topics dealt with. Social protection at illness, pension or unemployment is very differently regulated in individual EU member states. The information system MISSOC provides explanation and offers overview displays for single countries, an online query mask and regular analyses for every single EU country. How can advisers contribute to the strengthening of codetermination, participation and welfare state? Which projects and programmes are suitable to create a social Europe with the help of external expertise? 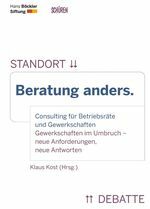 24 authors follow these questions in an anthology, which was published by the managing director of the consultancy company PCG Project Consult Prof. Dr. Klaus Kost in Essen. Besides Berthold Huber, chairmen of IG Metall trade union, Michael Vassiliadis of the executive board of IG BCE, also speaks about the cooperation of trade unions with external advisers. Dr. Werner Altmeyer from the training and consultancy network "euro-workscouncil.net" is represented with the following contribution: "Making apples and pears comparably: Adviser in the intercultural context". Do European works councils play a role beyond Europe? Who wants to challenge negative consequences of the globalisation cannot stop at the borders of the EU. However, at an international level an obligatory order framework is missing. To fill this gap, the trade unions conclude international framework agreements about social minimum standards with multinational companies. In the negotiations and the supervision of these agreements European works councils also play an important role. Dr. Reingard Zimmer of the training and consultancy network " euro-workscouncil.net " examines in her thesis the implementation of international social minimum standards under legal and political points of view, one chapter deals with European works councils particularly. Sicherung internationaler Mindeststandards durch Verhaltenskodizes? The European Commission is the driving force of the privatization of public services. The consequences are often employment reduction, precarious work and wage cuts. 25 authors represent the development in this anthology for some business sectors in Germany (energy, water-supply and distribution, hospitals, mass transit, post, telecommunications) and in select neighbouring countries (UK, Austria, Switzerland, Netherlands). Particularly interest is put on knowing which consequences privatizations have for the collective bargaining policy. The confederation of the service sector trade unions (UNI) has dealt with the topic Private Equity more intensively for several years. 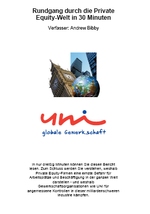 To explain the complexity of the investment strategy and its effects on the employees in a simple way, UNI has presented this booklet in July 2008. In only thirty minutes reading the reader learns why finance investors represent a danger for jobs and employment in the whole world and why trade unions demand adequate control of this billion heavy industry. The booklet is available in five languages. We have compiled an additional technical literature on a special page. From July 15th to 17th, 2008 a plenary meeting of the European works council of Bombadier took place in in the North-French town St.-Amand-les-Eaux. The Canadian group produces rail vehicles and business jets and has an EWC since 1998 according to British law. The German chairman Johannes Hauber of the Mannheim plant wants to ensure better participation rights with regard to future restructurings. For this reason the EWC discussed a possible EU financed project and individual aspects of the valid EWC agreement under participation of the training and consultancy network "euro-workscouncil.net". In May 2008 German works councils of Bombadier had already discussed this matter at a meeting in Bautzen (see report in EWC News 2/2008). Under the keyword "Anticipation of change" the European Commission supports such initiatives of European works councils with considerable financial subsidies. More exact details appeared already in EWC News 2/2008. The special negotiation body (SNB) for tesa constituted itself during a meeting in Frankfurt am Main from July 16th to 18th, 2008. The Hamburg adhesive manufacturer wants to change into a European Company (SE). Experts are Prof. Dr. Ulrich Zachert and Dr. Werner Altmeyer of the training and consultancy network " euro-workscouncil.net ". German and French workers' representatives of Takeda, the largest Japanese pharmaceutical company, have made an application to found a European works council. After a training of the German works council on July 16th and 17th, 2008 in Aachen German and French workers' representatives met in Paris on September 12th, 2008 to prepare the formation of the special negotiation body (SNB). The training and consultancy network "euro- workscouncil.net" provided the necessary expert support. For the German works councils the international cooperation gets more and more pressing. For this reason the German central works council was informed in the head office in Möchengladbach (photo) by the training and consultancy network " euro-workscouncil.net " on particularities of the Spanish labour law by Dr. Werner Altmeyer on August 13th, 2008. At present, possibilities of an EU financed project for the EWC of the Santander group, which has an important market position also in the UK are being viewed by the ver.di federal office and the European confederation of service trade unions (UNI). The European works council of Santander had signed an agreement on equal opportunities with central management on May 21st, 2008. The European works council of West Pharmaceutical Services in Eschweiler (Germany) came on August 27th and 28th, 2008 together for its first meeting. The training and consultancy network " euro-workscouncil.net " held a seminar in this frame for the newly elected EWC members. The EWC agreement had been signed in March 2008 (see report in EWC News 2/2008), the process of the EWC foundation had started in 2006 (see report in EWC News 1/2006). The new EWC Directive -- what comes towards us there?